Kody Anderson sent this monster Muley photo a friend took while scouting this summer. did you take this pic? i would like to know because i took it. 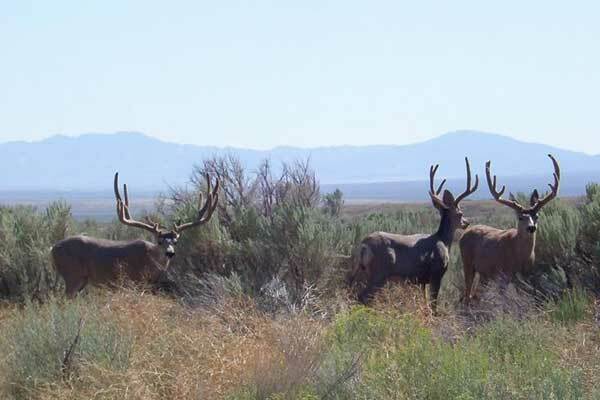 hey thats a wide wide buck on the left.the other bucks ar deacent but i think they should grow some more. monster muley 2007 monster elk monster muleys and im the one with the long hair and the painted face that looks at the camera. put him on the wall for sure! Yeah its true i wasn’t there when the buck was shot but the guy killed it brought it to my house right after. It was i think about 36 inches. But that was 4 years ago. The picture is doctored. The antlers have been stretched by about 5 inches on each side. Print the picture off and you can see the distortion in the bushes behind it. 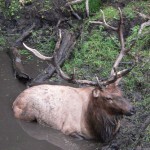 There are other pics of a large 3×3 in the same bachelor herd which has been stretched as well. So all you jokers who say you have seen this deer or know the person that took it, you are idiots.